I’m deeply focused on being someone my clients can trust. Aiming to deliver the best possible results while still being honest and maintaining integrity. 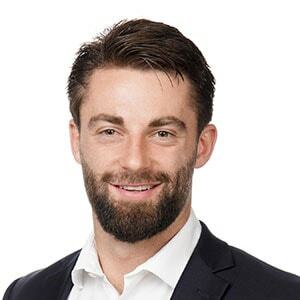 During the 6 years spent as an athlete in the AFL, with Port Adelaide FC and Melbourne FC, I developed an appetite for hard work and attention to detail, which serves as my foundation when working for my clients in the real estate industry. My speciality is the executive property market in East Perth. Continually monitoring properties currently on the market, properties sold and tracking other metrics, the depth of my knowledge is deep and only increasing. This allows me to provide clients with precise and nuanced valuations. Backed by an accurate valuation, I believe marketing that truthfully reflects the beauty of each property and that reaches the largest qualified audience delivers the best results. I grew up in the southern suburbs of Perth and after pursuing my football career in the eastern states I have returned to settle back in my hometown. Now a resident in East Perth myself, I have genuine interest in the East Perth community and am excited to see the development of the area. Whether it’s helping clients to buy or sell property, or just providing them advice, I deeply enjoy helping people and providing guidance so that they can achieve their property goals.